65-foot Metro Liner Bus rips through 10th anniversary banner at Sepulveda Orange Line Station. Metro Board Members (from left) Mark Ridley-Thomas, Eric Garcetti and Paul Krekorian as the bus breaks through the banner this morning. Elected officials on the Orange Line this morning. Photos: Metro. Elected officials at the media event. Current and former Metro Board Members celebrate 10-year anniversary of Metro Orange Line. The Los Angeles County Metropolitan Transportation Authority (Metro) today joined a host of San Fernando Valley representatives, stakeholders, community members and others to officially celebrate the 10-year anniversary of the Metro Orange Line, the most innovative Bus Rapid Transit line of its kind in Los Angeles County and the nation. 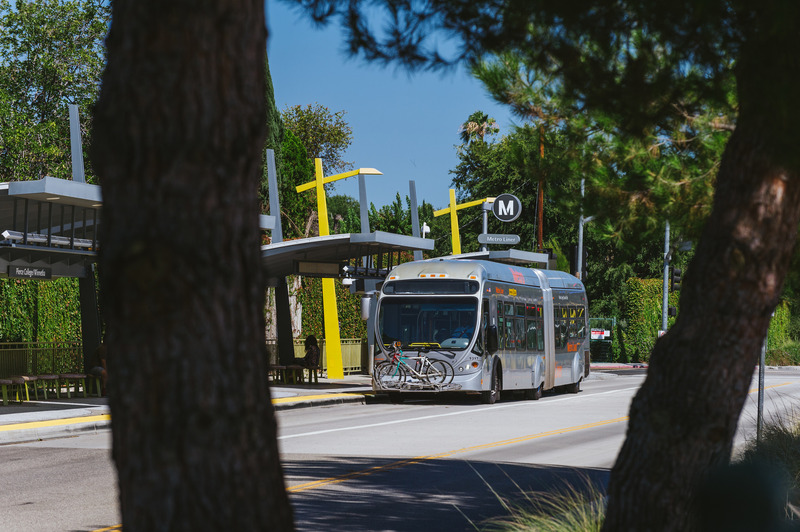 New amenities, development and connecting transit services are now in the works to make Orange Line service even better for Metro customers. Dubbed “The Valley’s New Shortcut” when it opened to the public on October 29, 2005, the Orange Line surpassed ridership expectations from the very first day of service to become one of the most heavily used and best performing bus lines on the Metro system. Ridership has nearly doubled in the last decade, vaulting from approximately 16,000 average weekday boardings in November 2005 to more than 29,000 boardings in September 2015. In total, the Orange Line has accommodated 74 million boarding passengers in the past decade, and its fast, frequent and reliable service has logged a 91 percent on-time performance record. The bus line serves as a natural extension of the Metro Red Line in North Hollywood that connects Valley commuters to Downtown L.A. and beyond via Metro’s expanding rail system. Metro has steadily improved bus frequencies to meet demand and extended the line to serve more Valley communities. Buses now operate every four minutes during peak rush hour periods. Just three years ago, the Orange Line was extended an additional four miles north from Canoga Park to Chatsworth to create an 18-mile multi-modal transit connection at the Chatsworth Metrolink/Amtrak Station. The busway’s pedestrian path/bikeway has grown in lockstep, and is now the longest transit-adjacent amenity of its kind in L.A. County. The idea of high-capacity buses running every few minutes on their own dedicated right-of-way and stopping at rail-like passenger stations was borrowed from similar BRT lines operating in Curitiba, Brazil. L.A. County officials visited Curitiba in 1999 and later tailored the BRT concept to meet the L.A. region’s particular transit demands. Plans for the busway were originally conceived on the back of a napkin to be a “rail car on rubber wheels.” Public officials and transit planners envisioned high-capacity buses to run on the line. The bold new “Metro Liner” articulated compressed natural gas bus built by North American Bus Industries was built expressly for the new service, and was a radical departure from the “breadbox” design of typical Metro buses. Metro Liners were the most aerodynamic, technologically advanced transit vehicle ever placed into Metro service, and the first articulated transit bus to operate on local streets in more than 20 years. Like Metro’s other BRT lines, Metro Liners contain a signal priority system that shortens the duration of red signals and lengthens green signals to help the buses more quickly traverse intersections. Metro continues to look for new ways to improve service capacity. In early October, Governor Brown signed new legislation that authorizes Metro to utilize double-articulated buses on the Metro Orange Line to significantly increase future capacity on the line. This new legislation will allow Metro to continue the agency’s leadership role by utilizing new technology to provide transportation service. A host of new amenities and services will improve parking capacity, safety, improve conditions for bicyclists and offer new residential, retail and commercial opportunities for Valley commuters. 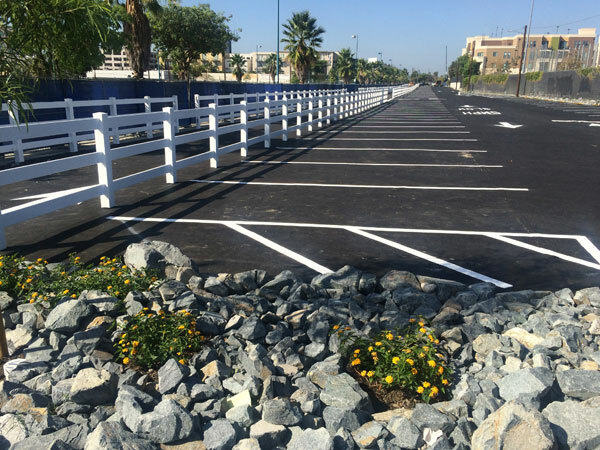 For example, next week Metro is planning to open a brand new nearly 200-space temporary park & ride facility, as well as an off-street bicycle path on Chandler Boulevard between Vineland Boulevard and Fair Avenue near the North Hollywood Metro Red Line Station. The lot is constructed by sustainable elements like special permeable paving and LED lighting. In addition, the new bike path will connect the Chandler Bikeway to the Orange Line Bikeway, encouraging the continuation of multi-modal trips for bicycle commuters traveling east-west across the Valley. Metro contractors are also now constructing an underground pedestrian passageway between the Metro Red Line and Metro Orange Line stations. The passageway will provide safe, convenient and direct access between stations, eliminating the need to cross Lankershim Boulevard at street level. Portals will be constructed between the Mezzanine level of the Metro Red Line Station and the Plaza level at the Metro Orange Line Station. Escalator, stair and elevator access will be available from both ends of the passageway, and additional ticket vending machines will also be installed for added customer convenience. The passageway should be completed in mid-2016. 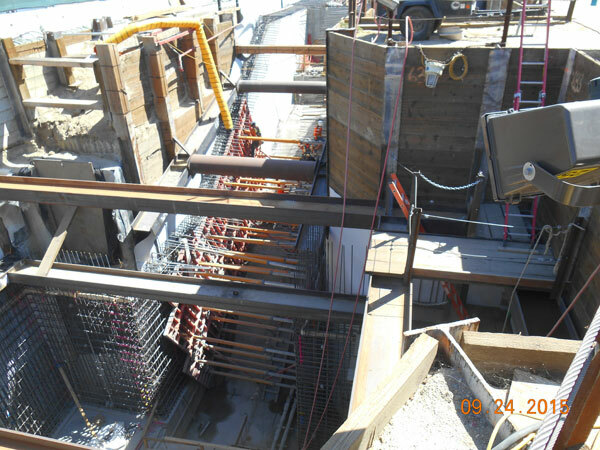 Metro Red Line/Orange Line underground passageway now under construction. Metro’s restored Lankershim Depot at the corner of Lankershim and Chandler Boulevards is now planned to house a coffee shop in spring 2016. Additionally, Metro also plans to utilize space within the depot for a new Metro Bike Hub. The Bike hub will provide customer service, bike repair and retail, as well as provide approximately 200 secure bike parking spaces on adjacent property. Metro plans to start design work for the bike hub in 2016, with a possible opening in 2018. As the eastern terminus of the Orange Line, North Hollywood is central to Metro’s future plans to create a thriving transit-oriented community that focuses on compact, walkable and bike-able places in a community context. 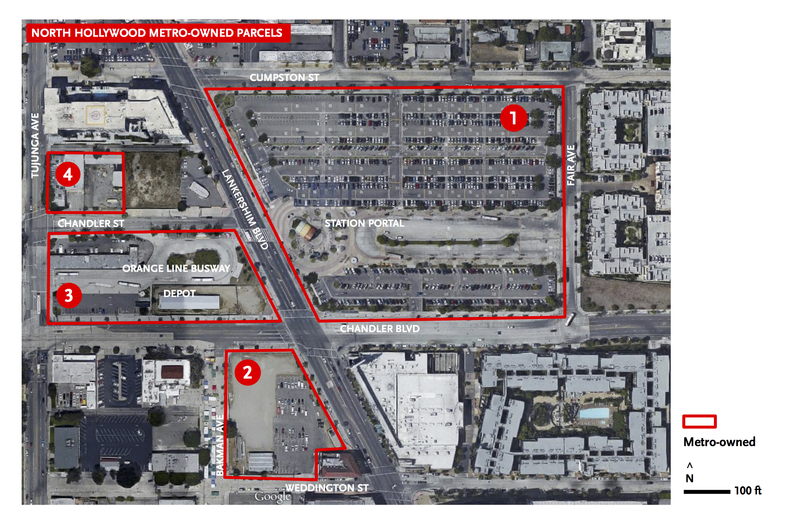 Metro owns four parcels encompassing nearly 16 acres of property at or near its transit stations. Metro is now working closely with the community on development guidelines that will be provided to a future developer. Current concepts include building a high-density but vibrant, walkable and transit-friendly development for North Hollywood that could also include affordable housing, commercial and/or office space. New bus services are also planned. 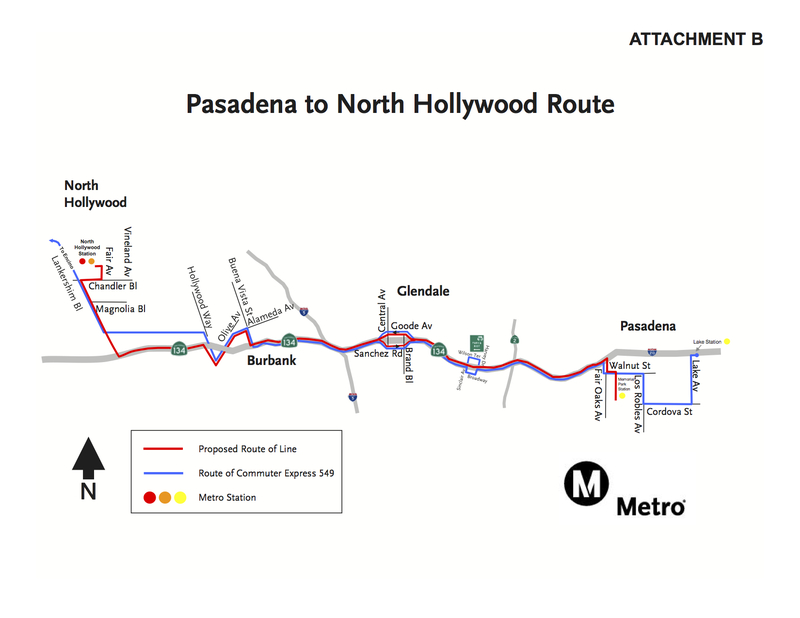 To coincide with the opening of the Metro Gold Line Foothill Extension on March 5, 2016, Metro now plans to launch a new pilot bus line: the NoHo to Pasadena Express. The service will operate from North Hollywood Orange Line and Red Line stations to Pasadena and will include six stops along the way. 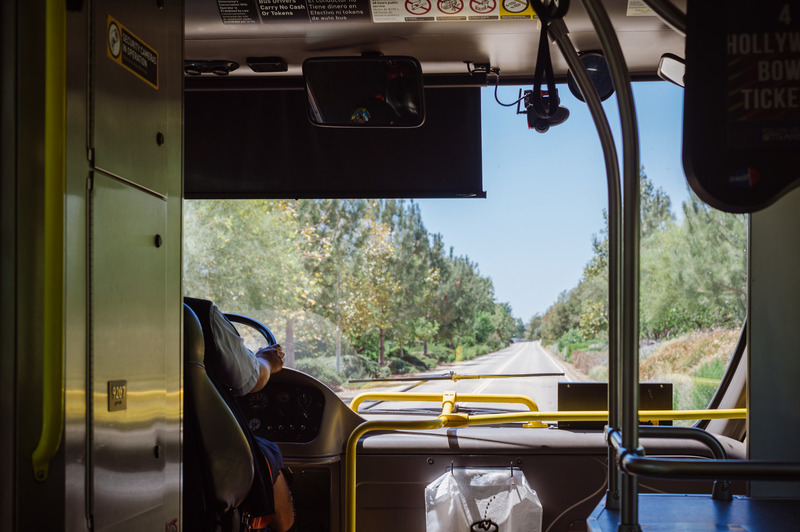 The service will run every 15 minutes during weekday peak hours, every 30 minutes during weekday off-peak times and every 30 minutes on the weekends to better connect the San Fernando and San Gabriel valleys. Earlier this year, a new expanded bus service connecting the North Hollywood Station with Bob Hope Airport was launched. The BurbankBus NoHo-Airport Route operates all-day, Monday through Friday, with buses departing North Hollywood Station every 15 minutes during morning and afternoon commute periods, every 20 minutes during the mid-day, and every 45 minutes in the late evening. This November, Metro is partnering with BurbankBus to extend this service during Thanksgiving weekend to include Saturday and Sunday. Late last year, Metro introduced a new “Valley-Westside Express” that provides transit riders with a faster, easier way to travel between the San Fernando Valley and West Los Angeles. The express buses run nonstop during peak hours between the Sepulveda Metro Orange Line Station in Van Nuys and Westwood. The service takes full advantage of the completed network of I-405 carpool lanes that now travel both north and south through the Sepulveda Pass. Lovely piece of PR for a rail ROW that ought to have been used at least partly for an extension to the Red Line (NoHo to Van Nuys certainly would have been justified) but alas we lived in the shadow of those well documented (see Elkind’s “Railtown” or Hobbs’ “Hidden History of Transportation in Los Angeles”) know-nothings (can you find one pictured above?) who destroyed the ability for San Fernando Valley to have the same access as other quarters of Los Angeles County have. Well, sort of. Metro did have a lot of input in a bus design that was already running on Wilshire when the 910 Busway opened in Late 2005, but the design has been sold to many other operators. There was a law passed in the state of California in 1991 that prohibited surface rail from North Hollywood to Hazeltine. This was passed due to the concerns of the Orthodox Jewish community in the area about the safety of pedestrians crossing a rail line during the Sabbath. The preferred type of transit along that corridor for Metro was light-rail. That law effectively made it prohibitively expense to put light-rail along that corridor. Metro never had any intension of extending the Red Lune subway along that corridor. The cost was not justified by the expected ridership. Or it would, if drivers would give the buses room to get in the carpool lane, or if the bus drivers weren’t too scared to merge. Unless you’re going in the direction opposite traffic, it’s not much of an express.